A team of researchers with members affiliated with several institutions in Belgium and France has identified the fossilized remains of a dinosaur from approximately 84 to 72 million years ago. In their paper published in the journal Scientific Reports, the group describes the dinosaur as a plant eater with teeth like self-sharpening pinking shears. The fossils were excavated at a dig site called Velaux-La Bastide Neuve on the southern coast of France—a site that has given up many other fossils. The researchers suggest the most notable thing about the dinosaur, which has been named Matheronodon provincialis, was its teeth. Not only were they quite large for a dinosaur of its size, but they were fewer in number. The researchers note that some of the teeth were 6 centimeters long and others up to 5 centimeters wide. As a member of the rhabdodontids, they had teeth with ridges covered by enamel on just one side—the other side had very little enamel and no ridges. Teeth that were located on the upper jaw were situated such that the enamel and ridges were on the outer side, while the teeth on the bottom jaw were the opposite. The net effect was a mouthful of teeth that resembled pinking shears (serrated scissors commonly used for sewing). When the team looked at the teeth under a microscope they found a similar pattern of enamel and ridging, which they noted protected the teeth from wearing away. Instead, chewing served not only to crush food for consumption, but also sharpened teeth. The researchers suggest M. provincialis was a bipedal vegetarian—its big teeth would have allowed it to crunch even the toughest vegetation, including palm tree parts, which the team believes were abundant during the time M. provincialis was active. They also believe it was approximately 16 feet long and had a short face. Prior research has suggested the area where it was uncovered was once a tropical river system that was part of a flood plain—which explained the presence of palm trees, flying reptiles, turtles and crocodiles all living during the same time period. Rhabdodontidae is a successful clade of ornithopod dinosaurs, characteristic of Late Cretaceous continental faunas in Europe. 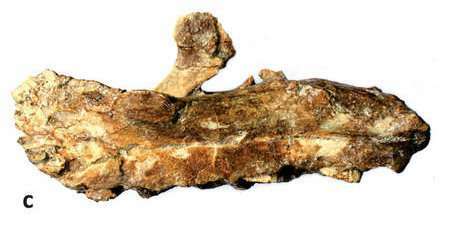 A new rhabdodontid from the late Campanian, of southern France, Matheronodon provincialis gen. et sp. nov., is characterized by the extreme enlargement of both its maxillary and dentary teeth, correlated to a drastic reduction in the number of maxillary teeth (4 per generation in MMS/VBN-02-102). The interalveolar septa on the maxilla are alternately present or resorbed ventrally so as to be able to lodge such enlarged teeth. The rhabdodontid dentition and masticatory apparatus were adapted for producing a strict and powerful shearing action, resembling a pair of scissors. With their relatively simple dentition, contrasting with the sophisticated dental batteries in contemporary hadrosaurids, Matheronodon and other rhabdodontids are tentatively interpreted as specialized consumers of tough plant parts rich in sclerenchyma fibers, such as Sabalites and Pandanites.